The Milwaukee Brewers announced today via press release and on Twitter that Ryan Braun underwent his thumb procedure today as scheduled. Brewers outfielder Ryan Braun underwent a cryotherapy procedure today on his right thumb. The procedure was performed by Dr. Vernon Williams at the Kerlan Jobe Clinic in Los Angeles. Braun will meet again with Dr. Williams on Monday, October 6. If there is no adverse reaction to the treatment, Braun will begin swinging a bat to determine the effect of the procedure on his swing along with this pain tolerance. Braun batted .266 with 19 HR, 81 RBI and 11 stolen bases in 135 games this season. The other breaking news of the mid-afternoon comes in the form of a pair of roster moves. Relief pitcher Alfredo Figaro was claimed off waivers by the Texas Rangers. Figaro, 30, spent parts of the past two seasons in the Brewers organization, compiling a 3-4 record and 4.46 ERA, in 82.2 innings pitched across 39 games, five of which were starts. Catcher Matt Pagnozzi cleared waivers and was outrighted to Triple-A Colorado Springs. Pagnozzi, who turns 32 in November, joined the Brewers organization as a minor league free agent in December of 2013. Pagnozzi was added to the 40-man roster as a September call-up in 2014, appearing defensively in just one game without recording a plate appearance. As a result of the two roster moves, the Brewers’ 40-man roster stands at 38. This number looks to fluctuate quite a bit this off-season as some pending free agents aren’t resigned and as the injured players currently on the 60-day disabled list are activated from the same. Today is Friday, February 14th. You may know it as Valentine’s Day. This year, I know it as Pitchers & Catchers Eve. I also know it as 45 days away from Opening Day. Acquired as a free agent prior to the 2013 season, Figaro returned to MLB after a successful pair of seasons playing in Japan for the Orix Buffaloes. Primarily a starting pitcher in Japan, Figaro spent most of his 2013 for the Brewers as a long reliever. He pitched in 33 games for Milwaukee, starting five and finishing eight. All told, he posted a 4.14 ERA, but his stuff predictably played up when he was entering games out of the bullpen. Here are his splits for 2013 by role. Figaro has a big fastball (which Pitch f/x says topped out at 98.7 MPH last year, and sits just over 95 MPH) which he compliments with a slider and much less so with a straight change. His fastball/slider combination was fairly effective at generating groundballs. He had a 56.8% groundball rate with his slider as a matter of fact. Unfortunately, opponents hit .290 off of Figaro’s slider last year. The 29-year-old Figaro, who hails from the Dominican Republic, totaled 77.0 innings in 2013 but would have pitched even more had he not hit the disabled list in late June with an oblique injury. That injury opened the door for Johnny Hellweg’s MLB debut, but that’s neither here nor there. Figaro was activated off of the disabled list on July 24th and then optioned down to Class-AAA Nashville on August 16th. 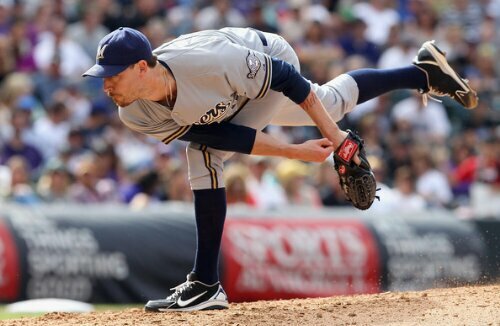 He rejoined the parent club at the end of August, after John Axford was traded to the St. Louis Cardinals. Looking ahead to 2014, Figaro may be a fine choice for long man to start the year, but the bottom line in a bullpen without many openings is that Figaro does have one minor league option remaining. As a result, Figaro may see even more frequent flier miles. The Opening Day bullpen might have a job for him, but that hinges on one or more of a handful of factors. Is Tom Gorzelanny ready to go? Did they keep their Rule V pick Wei-Chung Wang? When do they need their fifth starter and would they start the first four games of the season with an extra bullpen arm? Figaro has proven that he’s capable of being a useful arm, but how much of that he’ll be able put in a Major League boxscore remains to be seen. I’m predicting that Figaro will find himself on a few extra airplanes this year as he travels up and down as needed. Following the Brewers’ 9-3 win over the Chicago Cubs on Tuesday evening, the team announced the Alfredo Figaro was the latest Brewers player to succumb to injury. Citing an oblique strain that popped up three starts ago — which would help explain the downtick in performance as well — Figaro was placed on the 15-day disabled list, retroactive to Monday, June 24th. The big news of the move though was who was recalled to take his place both on the roster and in the starting rotation. Top prospect, the 6’9″ fire-balling righty Johnny Hellweg was recalled from the Triple-A affiliate Nashville Sounds. He’ll join the team officially tomorrow and travel to Pittsburgh on Thursday evening in preparation for his Major League debut. He’s been pitching a bit more to contact, worrying less about the strikeout, and letting his defense work. Ironically, he’s currently scheduled to square off against Gerritt Cole, the top pitching prospect for the Pirates who also has been conspicuously devoid of strikeouts since his MLB debut. He’s another fireballer who has let his natural movement and disdain for pitching outside the zone work to his advantage. 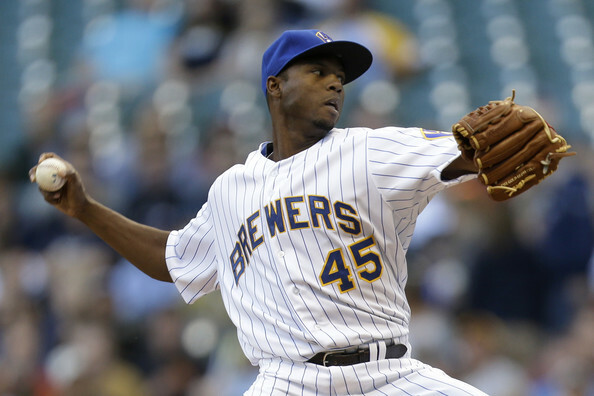 Hellweg was called upon because, as manager Ron Roenicke put it, they needed another starter with Figaro getting hurt. Still, there’s something telling about Hellweg coming up for an audition in advance of the trading season. 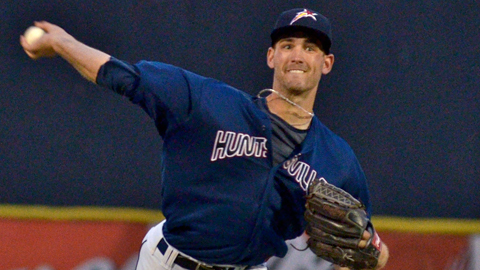 Hellweg represents the spearhead of a wave of touted pitching prospects reaching the upper levels of the Brewers’ system. That he was a part of the return in the Zack-Greinke-to-Anaheim deal along with Jean Segura just makes his debut that much more exciting. Bottom line: Set your DVRs for Friday night in Pittsburgh if you aren’t going to be home. As for me? My wife and kids are going up north on Friday morning. I’m considering a road trip to Pittsburgh for Hellweg’s debut. Who’s coming with me?